**Correction: According to Mike from Burghertime, the guy far, far away from me at our table was Jacob from Eatsburgh, not Jake as I thought based on the list of 'yes' RSVPs on the Meetup site -- I am so sorry for the error! I have a terribly hard time hearing in crowded environments and he was sitting far away from me! I think I got everyone, with a little help from the Meetup site since I didn't actually get to talk with some bloggers at the far end of my table or at the other table. My apologies if I messed up anyone's information or forgot someone. 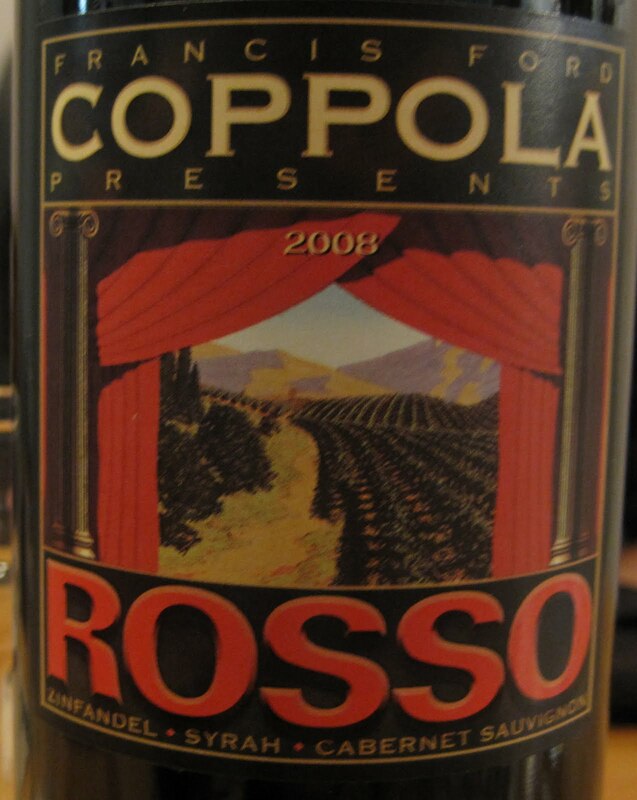 Since Dozen is BYOB, people brought beverages. There were several bottles of wine and some growlers filled with beer. I think one beer was from Church Brew Works, the Beer de Noel beer, perhaps? And another one from East End Brewing? Remember, I am not a beer person. I'm pretty clueless about all things beer. Chef James from Dozen served us a 3 course meal. 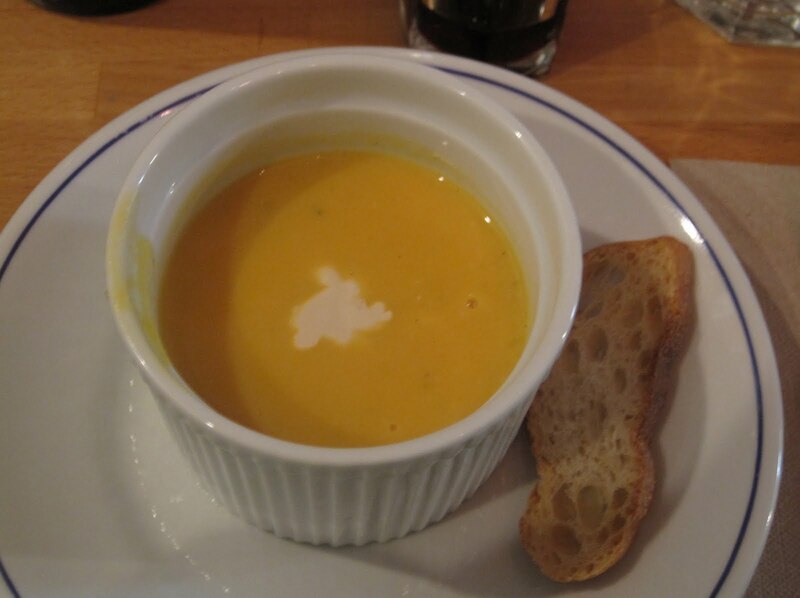 The first course was a squash soup with crostini: I am not usually a huge fan of squash. This was a tasty soup, a very nice squash taste. I think my nose & taste buds failed me, however, because I didn't notice any garlic, but then suddenly other people were talking about a hint of roasted garlic in the soup. I had a little panic attack and glared at SP - he is supposed to warn me of garlic! Instead, he watched me slurp up all the soup! It must not have been much garlic or it must have been roasted enough to render it harmless to my stomach because I am happy to report there were no garlic reactions! 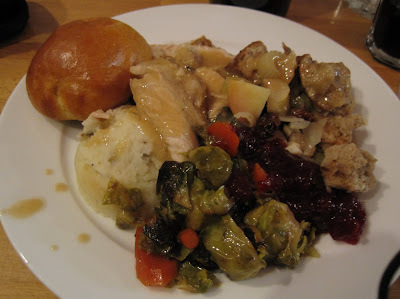 The main course was a holiday meal: Turkey with gravy, a dinner roll, mashed potatoes, stuffing, cranberry relish, and roasted carrots & brussel sprouts. I cannot remember the exact descriptions that our server gave us. The stuffing was very tasty with rye bread cubes and celery & onion chunks. Moist turkey. Not too much gravy. Tasty dinner roll. Good mashed potatoes. And carrots & brussel sprouts roasted in soy sauce & honey, I think - ? That's what I can't quite remember. They were tasty - the brussel sprouts were so much tastier than the ones I made in November!! I am so ashamed of those now. Dessert was the third and final course. 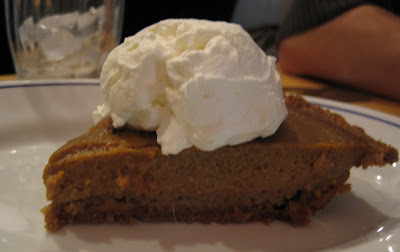 A choice of pumpkin pie with a gingersnap crust: Or an apple crisp: I really liked the gingersnap crust - a nice change from the usual pie crust. 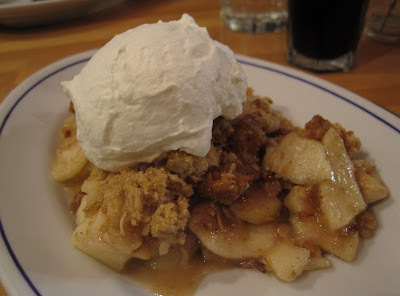 The apple crisp was tasty, too, even though there were some oats and I don't like oats. SP liked my apple crisp better than his pumpkin pie, which surprised me because pumpkin pie is one of his favorite desserts. The whipped cream was amazing! At home, we use cans of whipped cream. Those squirts of whipped cream rapidly melt and run all over dessert. But this whipped cream maintained its shape. It didn't break down, melt, and ooze all over after a few minutes. It stayed in a nice round scoop even after 15-20 minutes. 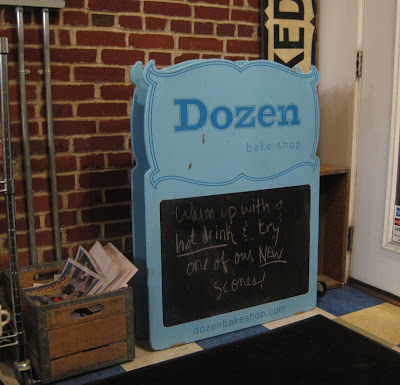 A tasty meal from Chef James at Dozen. Truthfully, I enjoyed the company much more than the food. 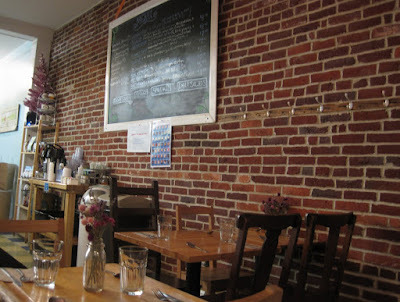 Pittsburgh Food Bloggers are a very friendly and fun bunch. Mike has a wonderful infectious laugh and he is so outgoing and friendly - he puts everyone at ease and we're lucky to have him as the organizer. Last night was filled with lots of laughter and dare I say holiday cheer? 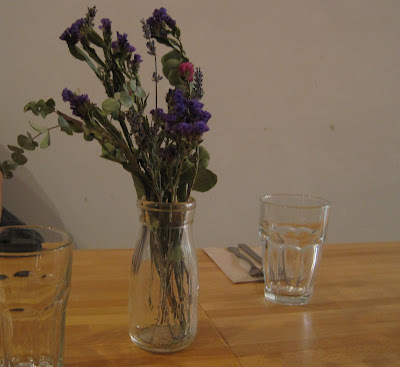 Although I know that there is always much more to someone than just what is on their blog, it still is a nice surprise to sit down with fellow bloggers and learn about the person behind the blog, all their other interests and experiences, because believe it or not, food bloggers are not just about food! We also love wine and beer, we all have interesting travel experiences to share and family food and non-food traditions to share, and yes, we love to compare notes on restaurants and talk about food and cooking shows and food magazines. I look forward to future meetups and getting to know everyone, especially the bloggers I didn't have a chance to talk with much. Damn, I keep missing these meetups. I really need to get a grip on my schedule so I can make it to one of these get togethers. Looks like you all had a blast. Great meeting you last night! I'm seriously still full from all of the food. Lesson learned: you don't need to eat everything on your plate. (By the way, the guy at the end of our table was Jacob from eatsburgh). Had a great time chatting with you on Wednesday night and enjoyed reading your write up of the event!